The experience of living an historical work of art. On the top of Hyderabad in India, nestled amidst verdant and unique themed gardens, with the inspiring views of Charminar and further down of the domes and minarets of the old city, rises the marvelous Taj Falaknuma Palace. This 60 room palace, in the shape of a scorpion, was a royal home of the legendary Nizam who governed the city. Today, after ten years of sensitive restoration works, it's a luxury hotel of dramatic beauty and a true work of art. Built entirely of Italian marble, the building presents a rare combination of Tudor and Italian architecture. Its interior houses valuable pieces art, ornate inlaid furniture from Kashmir, rich handcrafted French tapestries and frescos with Indian and English influences that confer it a distinct Baroque style. The former royal family and state rooms are now the suites for guests. In the restaurants you can discover the best specialties of Hyderabadi cuisine or refined Italian flavours. To complete your stay, try the royal treatments and exclusive signature therapies in the luxurious Jiva SPA. The city of Hyderabad has over 400 years of history, unique architecture, rich gastronomy, one of the biggest movie industries of the world and a vibrant life. 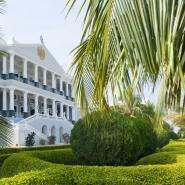 Come discover it and visit the Taj Falaknuma Palace. Lakes - Hussain Sagar, Osman Sagar, Himayat Sagar and Shamirpet. Parks - Indira, Lumbini and Sanjeevaiah. The Taj Falaknuma Palace Hotel is situated in the city of Hyderabad, in the Andhra Pradesh region, about 20 kilometers from the Shamshabad Rajiv Gandhi international airport.